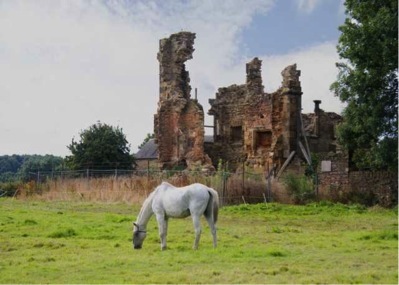 Tankeresleia was an 1800 acre Lordship and was held prior to the Norman Conquest by Ledwin; a Saxon Lord. William the Conqueror deprived Ledwin of his Lands, and gave the land to Earl Meriton (or Moreton) and it passed down several generations and passed to a family who assumed the name “de Tankersley”. During the Saxon period and up to this point the Village had a church and a Presbyter, at the end of the line of Tankersley Sir Henry de Tankersley had only one son, Richard, who died towards the end of the 13th Century. He left only two daughters one of whom married Sir Hugh Eland, who created the Tankersley Park with a “Grant of Free Warren” from Edward III. The Eland family did not hold the land for long as they were passed to the Savile family as a dowry when Isabel heiress of Thomas Eland married Knight Sir John Savile in 1375. It then passed from the Savile family to John Talbot, a general in the Hundred Years war with France who was made Earls of Shrewsbury in 1442. Tankersley Park passed down through 11 Generations of Talbots until Francis Talbot the 11th Earl of Shrewsbury sold the land to Thomas Wentworth who became the First Earl of Stafford. After the Wentworth family came to Tankersley Park, the great family seat of Wentworth Woodhouse was built and the Old Hall leased out to Sir Richard Fanshawes in March 1652. 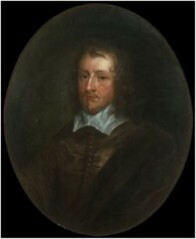 Sir Richard Fanshawe was a Royalist in the English Civil war and Charles I dispatched him to Spain and was captured in battle of Worcester in 1651, the last battle of the War in which the Parliamentarians defeated the Royalists. After the Restoration of the Monarchy in 1660, he became a loyal servant of Charles II and served as Ambassador for Portugal, and then Spain until he died in Madrid in 1666. 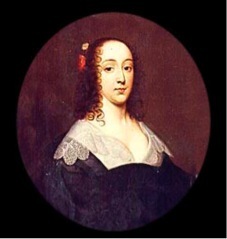 The House served as a main residence for the family, but in July of 1654, Anne their daughter died and was buried in Tankersley Church, they left the house before the end of the year and returned to London. 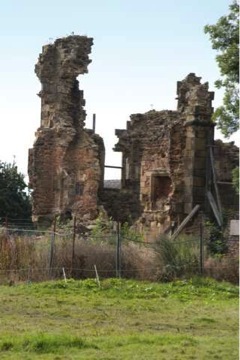 Tankersley Old Hall was built, in the late 16th century, by the Savile family. The earlier manor house site is thought to have been on the north of the St Peters Parish church, where the remains of an old moat can still be found and where the 19th Century Rectory now stands. During 1984 an archaeological investigation of the Old Hall by the County Archaeology Service has shown that the late 16th century house was an enlargement of an earlier structure, almost certainly a late medieval Hunting Lodge. The Wentworth Estate was remodelled in the early 18th century to suit contemporary taste, with artificial lakes and follies, and the Old Hall fell into disuse and was gradually dismantled in the 1720’s and 1730’s, Its stone and timber were re-used in a number of buildings including the present farmhouse which stands to the west of the single block of the Old Hall which was allowed to survive, and the ruins of you can see today. Later in the 18th century the park was divided up and both coal and ironstone mines were created, and the landscape started to change. 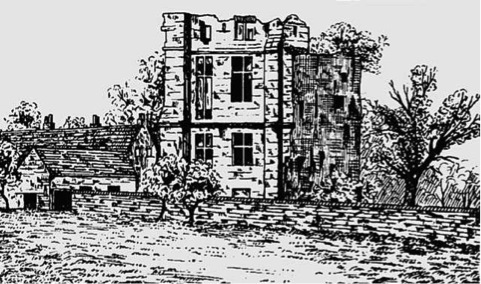 At first sight the ruins of the Old Hall appear to represent one bay of an Elizabethan stone-built house of three stories with mullion-and-transom cross windows and hollow-chamfered string courses. On closer inspection it can be seen that the east wall is in fact the west wall of an earlier building. During the 16th Century it was common for the nobility to take existing structures and completely re-model and extend them. A similar modification to a hunting lodge was Sheffield Manor. Only one rectangular block of the hall exists today, and it is in a very advanced state of decay, and storms have made this much worse. An engraving made in the 18thCentury shows the Hall to be a long building with several projecting Tower-like bays to the front (Facing North). However the 19th Century sketch shown on the previous page shows a lot less. The building looks to be 3 stories, and there is evidence of a cellar on the site, now filled in. If you look closely you can see from the remains on the East wall that it is the west wall of an earlier structure, and contains the remains of a Medieval fireplace from that previous structure, on the ground floor. This wall has a fireplace near its south end, with a chimney behind it. The fireplace has a flat-pointed arch with a moulding of rolls and hollows that look very different to the Elizabethan fireplaces on the First Floor. On the first floor there are a series of heavy corbels, also of medieval character; a similar range of corbels on the external (i.e. west) face of the wall towards its north end carries a projection, probably a second chimney stack. At first floor level the internal (east) face of the wall has been largely rebuilt in brick, with two good Tudor fireplaces. The outside wall keeps its medieval outer face. One unusual feature of the ruin is that it has lead drainpipes to take the water off the roof embedded in the wall, which you can see in the picture. 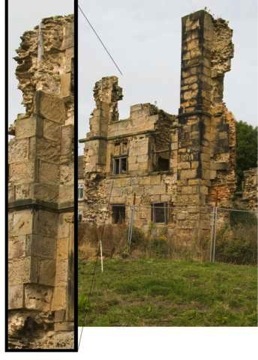 The Archaeology report from 1984 mentions that the field to the East contains masonry just under the surface of the soil, and that further archaeological surveys could reveal more information regarding the layout out the Elizabethan manor house, which we know as Tankersley Old Hall.